This 8203U daughter is one of our favorites. She is well marked, powerful, feminine, fancy fronted and great uddered. 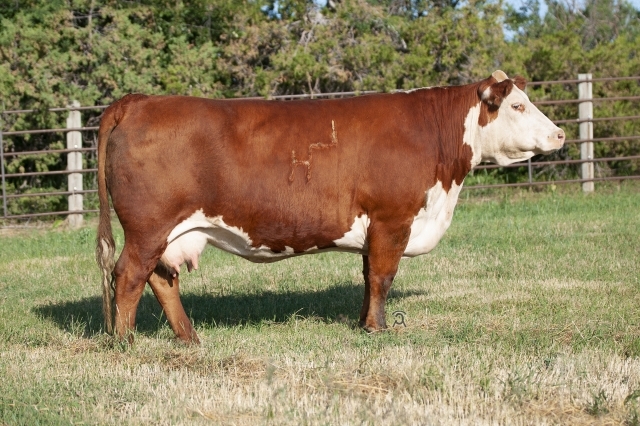 She is a tremendous maternal and carcass female and produced a son that sold for $20,000 to Dufur Herefords in our 2013 Sale and she is also the dam of the HH Advance 4075B bull that sold for $240,000 in our 2015 Sale. A son by 3006A sold for $30,000 in our 2017 Sale to Jamison Herefords. We are also using another son 7076E that was retained from our 2017 calf crop. 0121X is a carcass female deluxe that ranks as the #7 horned dam with GE EPD's in the breed on MARB EPD and her daughter by 1069Y is the #1 horned dam in the breed with GE EPD's on MARB EPD. 11 progeny of 0121X have an average IMF ratio of 134.5 on ultrasound. This big ribbed, easy doing donor cow is one of the top all around females in the breed. Look for a powerful set of sons and grandsons in our 2019 Sale.